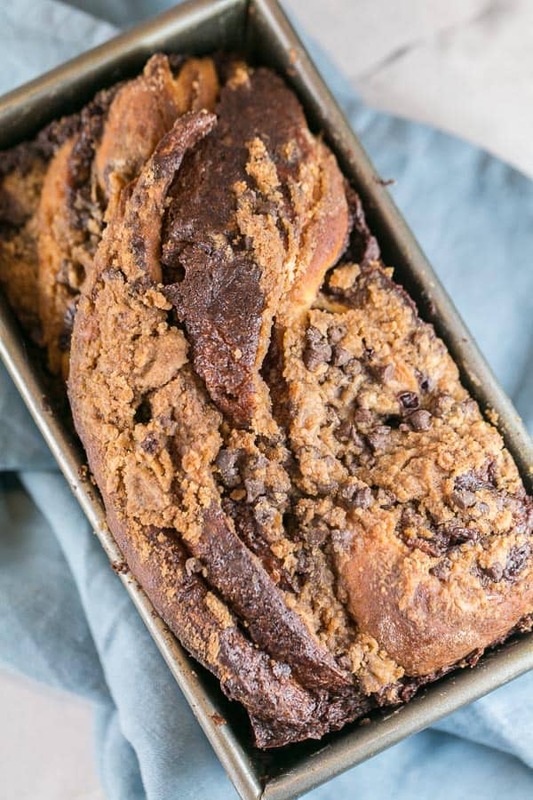 Rich, buttery yeast bread with swirls of a chocolate-cinnamon filling and covered with a streusel topping, this chocolate babka is even better than one from a classic Jewish deli. This recipe makes two large loaves: one to share or one to freeze for later! Plus, everything you need to know about babka, from the history to shaping the swirly bread to storage tips. Let’s pretend that it’s not actually the beginning of February, and it’s still actually January. And thus, I am introducing the first month (you know, January) of 2019’s “Year of the …” series. Don’t let my tardiness take away from my excitement over this; yeast breads have, by far, been my most requested recipe category for years. 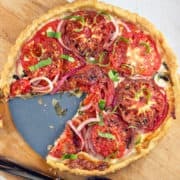 With this amazing push for eating local and in season, I think more and more people are also excited at the idea of making things at home – not necessarily because they have to, but because (a) it’s exciting and empowering to make your own food, and (b) you actually know what goes into things. So this year, we’re going to tackle all sorts of yeast-based bread products together. Not just a loaf of bread (although we’ll cover different breads too), but also things like the best pizza dough (preferably one you can make ahead of time, so you can make weeknight pizza!) and bagels and cinnamon rolls. But we’re kicking off this series with arguably the very very best bread of them all: chocolate babka. First, let’s dive on it. Never heard of a babka? Confused because there are multiple types? Your babka education starts here! Babka is a sweet yeast bread or cake. (See? Yeast. Yeast Bread of the Month!) Babka actually means little grandmother in Ukrainian and Yiddish. There are actually two different kinds of babka out there. The Polish-originating babka is a yeast cake, usually filled with dry fruit, baked in a tall, swirled bundt pan. This is not the kind of babka we are discussing today. I’m sure it’s good, but… nope. I asked some friends what their general questions were about baking babkas and more than one asked if it was actually Jewish in origin. The chocolate babka bread we are discussing today is, indeed, Eastern European Jewish in origin. For many years, you could really only find babkas in true Jewish bakeries, although it’s becoming increasingly popular and popping up more and more places. This kind of babka is made from a twisted yeast dough and baked in a loaf pan. 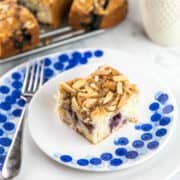 Fillings are generally sweet, like cinnamon or chocolate, and the loaf is then topped with a sugary streusel topping. What does Babka Taste Like? As someone who is Jewish, and has been to great Jewish delis many times, it’s hard to imagine not knowing what babka tastes like. But my little poll taught me that while many people are familiar with babka (thanks, in part, to Seinfeld’s “lesser babka” episode), a lot of people actually haven’t had one. A babka bread is slightly sweet and rich, made from lots of butter, milk, and eggs. But the best part of a babka? The swirled filling. Whether it’s chocolate (like here), nuts, or cinnamon, a layer of sweet spread is swirled in between many layers. Babka has the perfect contrast between the slightly dry bread and the rich, thick filling. You’re looking for a filling that is spreadable and thick enough to stay in a layer (kind of like peanut butter). 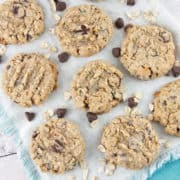 It’s the perfect anytime snack — sweet enough for dessert, but still somehow appropriate for breakfast. I’ll be honest: making babka takes time. It’s not hard or complicated (despite the number of steps!) but this is not a “have a finished product in an hour and a half” kind of dessert. What makes this the “best” chocolate babka? 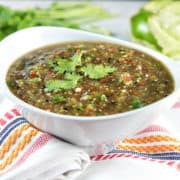 Yeah, I’m being one of those annoying people and calling this recipe THE BEST. Because it’s really, really, really good — the best babka I’ve had, at least. The dough is rich and hearty, but not too dry. It rolls like a dream and is wonderfully soft and not at all sticky (thanks to a rise in the refrigerator, instead of room temperature). It’s thick enough to hold up to a thick filling, but not overly dense. And it’s juuuuuust the perfect amount of sweetness. The filling is so good. It’s practically a chocolate fudge — imagine a big mug of super thick hot chocolate, but solid. And then a layer of miniature chocolate chips for a little extra texture and crunch. As if that’s not enough, there’s an entire brown sugar streusel on top, with more chocolate chips. Oh, and then a sugar glaze. So in the same bite, you get soft bread, decadent chocolate, crunchy streusel, and sugary glaze. Now we’re talking. How do you shape babka? Start by rolling your dough out into a big rectangle. 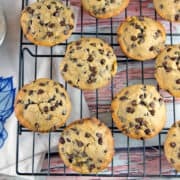 Spread on the chocolate filling and sprinkle with chocolate chips (because if the question is whether or not you should add chocolate chips on top of your layer of chocolate spread, the answer if always yes). Next, take the long side and start to roll the babka into one long line. Once the dough is fully rolled, grab a knife and cut it in half, the whole way through, vertically. You’ll have two really long pieces of dough with chocolate running through them. Twist these two pieces of dough around each other from start to finish. Then take this long twist, fold it in half, and give it another twist. 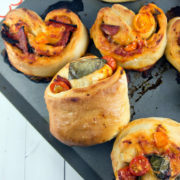 Place this twisted dough into the prepared loaf pan. 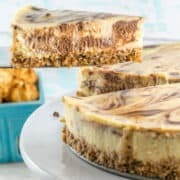 It doesn’t matter which way you put it in — swirly side up or down — because we’re going to cover it with a streusel topping anyway. How do you know when babka is done baking? Easy: use a thermometer. Science! Data! You want to know when it’s really done? Stick a thermometer right in the center. You want to make sure the center of your babka is not under baked; otherwise, the weight of the filling will collapse the center of the bread. Bake until an instant-read thermometer measures 190 °F. Look, let’s be honest here. If you have leftover babka you need to figure out how to store, I’m not entirely sure we can be friends. Because the best thing to do with your babka is eat it immediately. There is zero self restraint when it comes to a chocolate babka. But I get it. This recipe makes two babka loaves. The process takes long enough that you may as well make two at the same time – one for you, and one for a gift for friends or neighbors. Or even better, one for you… and another one for you, too! Does Chocolate Babka Need to be Refrigerated? Nope! 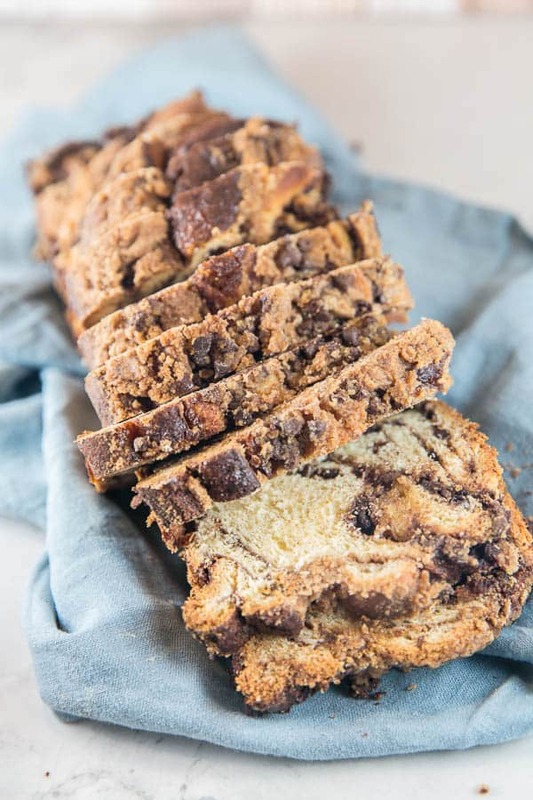 The sugar content in the chocolate spread of this babka is high enough to delay bacterial growth, so your babka can stay in an airtight container for 4-5 days. It’s most delicious on the first day, but 5 days later I was still happily enjoying a slice after dinner. Can Chocolate Babka be Frozen? Yes! In the two for me, none for you baking scenario, why not enjoy one chocolate babka now and another chocolate babka next month? To freeze your babka, bake and cool completely. Then wrap in a layer of aluminum foil and place inside a zippered freezer bag. Store in the freezer for up to 3 months. Thaw overnight and enjoy the next day at room temperature, or pop back into the oven for 5-10 minutes for a toasty warm slice. Babka is a most-of-the-day baking project, but one that is so, so worth it. Homemade babka is beautiful, delicious, and an extra special treat. 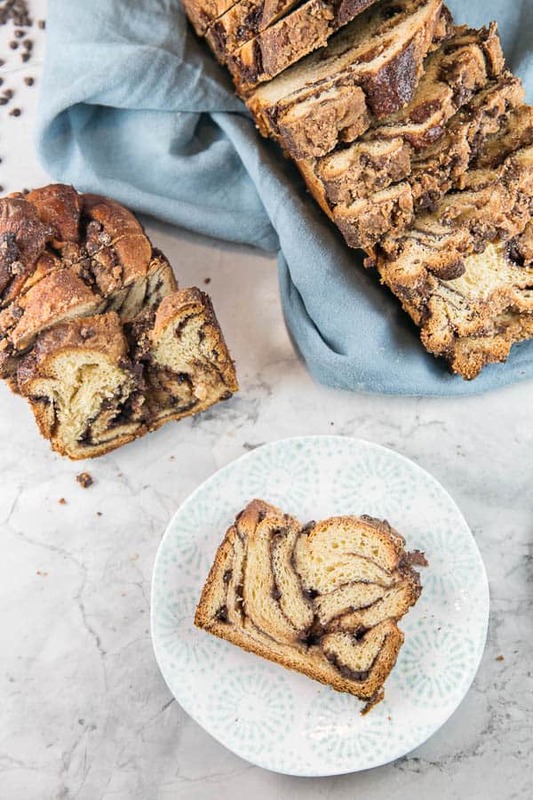 Rich, buttery yeast bread with swirls of a chocolate-cinnamon filling and covered with a streusel topping, this chocolate babka is even better than one from a classic Jewish deli. Prepare the dough. 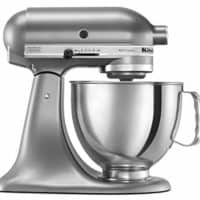 Combine together the milk, yeast, and 1 tablespoon of the sugar in the bowl of an electric stand mixer fitted with a dough hook (or in a large glass mixing bowl). Whisk together and set aside for 5 minutes, or until frothy. Transfer the dough to a large lightly greased bowl and cover with plastic wrap or a clean kitchen towel. Set aside to rise at room temperature for 1 hour. After 1 hour, transfer the bowl to the refrigerator, still covered, and set aside for 1 hour, until dough has doubled in size and is firm to the touch. Prepare the filling. While the babka is rising in the refrigerator, make the chocolate filling. In a small bowl, combine the sugar, cinnamon, vanilla extract, and cocoa powder. Pour in the melted butter and stir to combine. This mixture will look a little granulated from the sugar. Set side. Shape the babka. 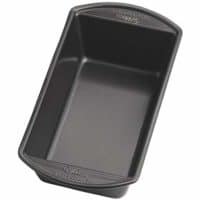 Grease two 9x5-inch loaf pans. Remove the dough from the refrigerator and gently punch it down. Cut the dough in half; remove half from the bowl and recover the other half and set aside. Roll the dough into a roughly 9-inch by 18-inch rectangle. Spread half the filling over the dough, leaving a slight border along the edges. Sprinkle half the chocolate chips over the top of the dough. Working from the long side of the dough, roll the dough into a long cylinder (see photos in post for more detail). Using a sharp knife, cut the dough in half long-ways down the length of the cylinder to expose the chocolate filling, creating two logs of dough. Twist these two logs together (pictured above in post). Fold in half one more time, twisting again, and place dough in the prepared loaf pan. Repeat with the remaining dough. Cover both loaf pans with plastic wrap or a dish towel and set aside to rise again at room temperature, for another hour. Make the streusel topping. In a small bowl, mix together the brown sugar, flour, and cinnamon. 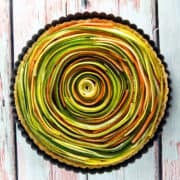 Cut in the cold butter using a pastry cutter or two knives until the butter is pea-sized and the mixture has a sandy texture. Stir in the chocolate chips. After the dough finishes rising, sprinkle the streusel topping over both loaves. Make the syrup glaze. Combine the sugar and water in a small saucepan over medium heat. Simmer for 5 minutes, stirring occasionally, until the sugar dissolves. Set aside to cool. Bake the babka. Bake the loaves at 350 °F for 40 to 50 minutes, until the top of the loaf is golden brown and the inside registers 190 °F using an instant read thermometer. As soon as the babkas are done baking and come out of the oven, use a long skewer or knife to poke holes all over the bread, pushing all the way down to the bottom. Brush the simple syrup on top, equally dividing between the two loaves. Allow the breads to cool in the pans for 10 minutes, then transfer to a wire rack to cool completely before serving. Babka can be stored in an air-tight container for up to 5 days, or frozen for up to 3 months. To freeze, wrap fully cooled loaf in aluminum foil and place inside a plastic freezer bag. 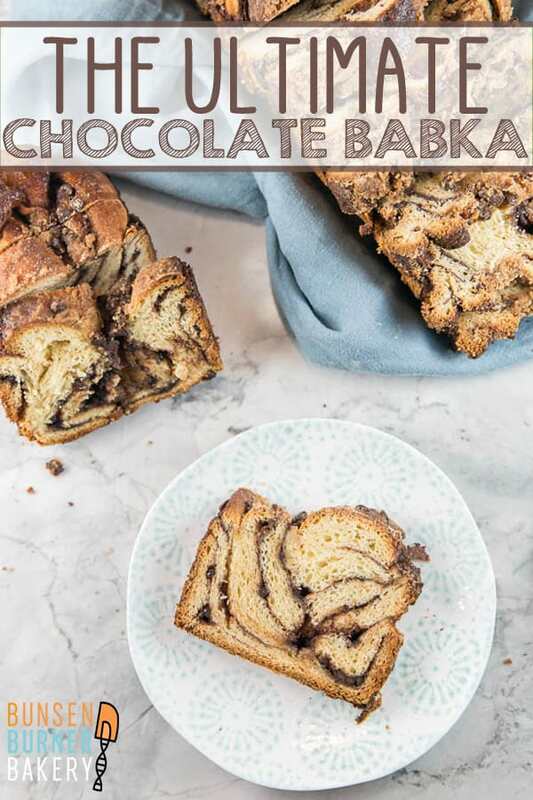 Love your step by step process in making this super delicious and flavorful Chocolate Babka. This is unique and surely need to try this weekend. 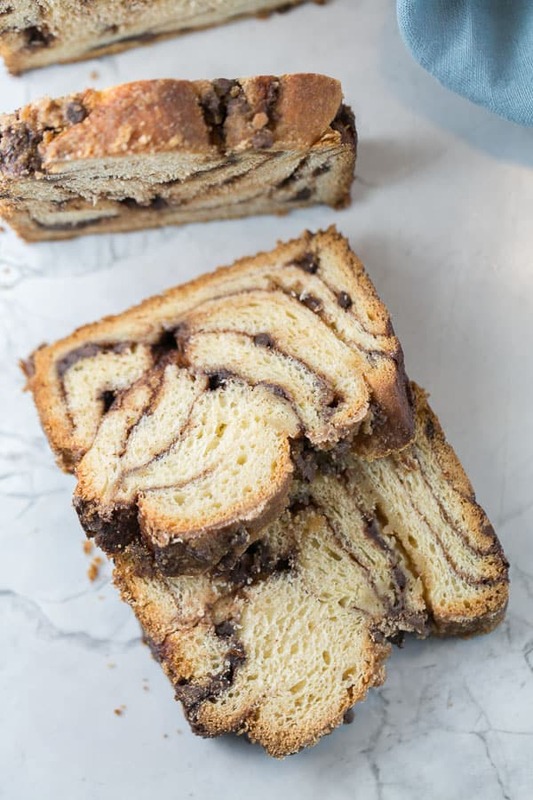 This chocolate babka looks so delectable that I just want to take a bite! I’ve never made babka, but now I can’t wait to try. Thank for this great recipe! Baking more yeast breads is on my list of things to master. 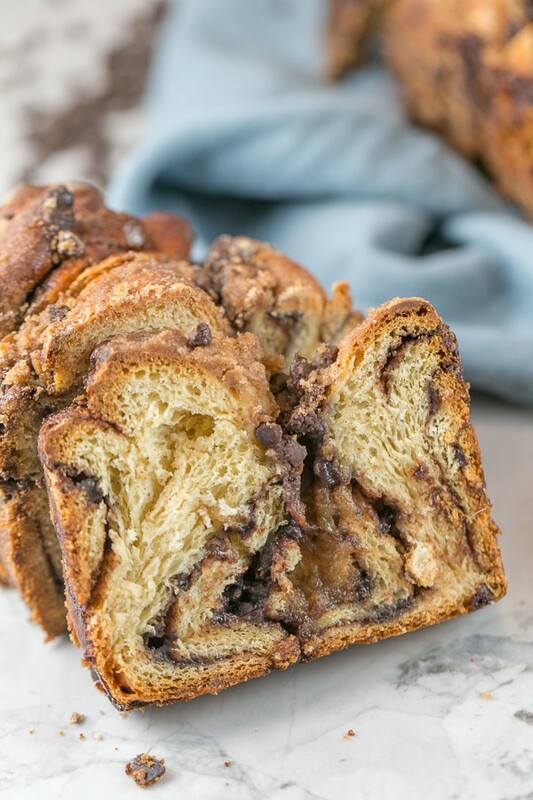 This chocolate babka is certainly pushing this goal up on my to do list! Thanks for the push! Love babka and loved learning so much about it :)!!! Thanks so much for sharing :). Great read! 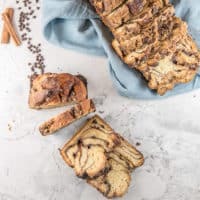 Making Babka is on my culinary wish list of recipes to try. I love your photos and I feel that it is about time for me to try to make this once and for all. Wow this looks amazing!! I have never tried babka but you are inspiring me to try it!! Pinned! Oh wow, this babka looks really amazing. 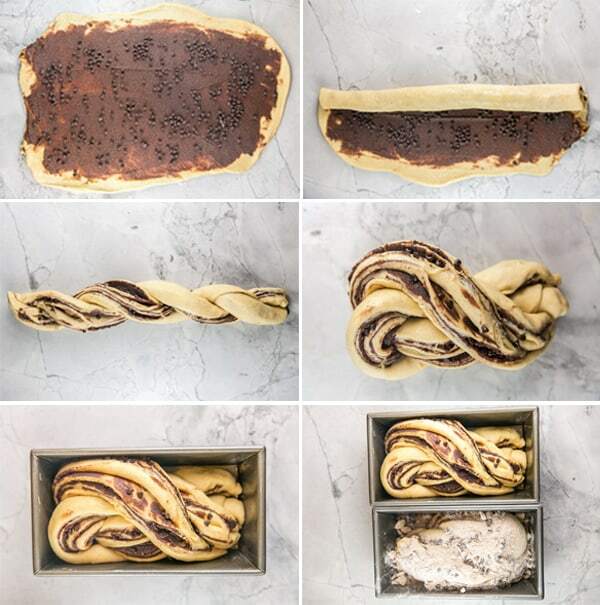 I know about babka a lot, my grandma used to make it, but this looks beyond delicious. Better than my grandmas- seriously! I love delicious flavored swirl. I must save this and make it for my boys. They will be thrilled. 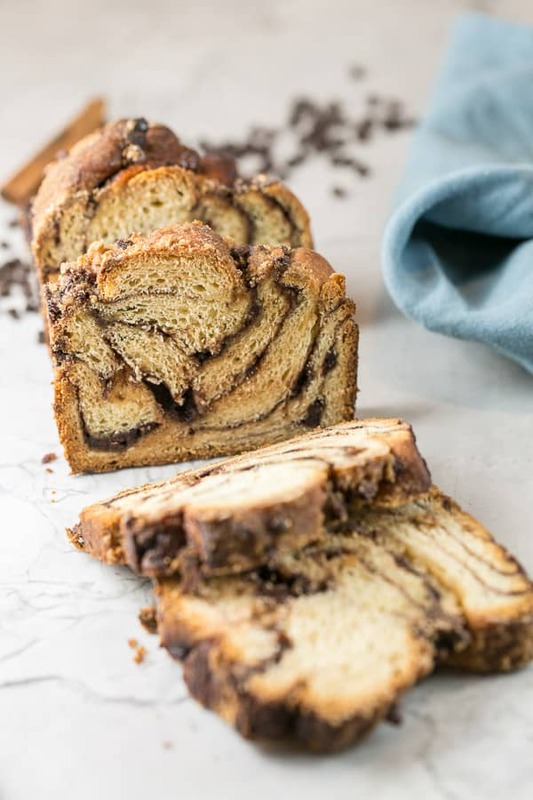 The marble look in the inside of this babka is so beautiful and inviting! Thank you so much for the detailed step-by-step. There’s no way I’d be able to pull this off without it!